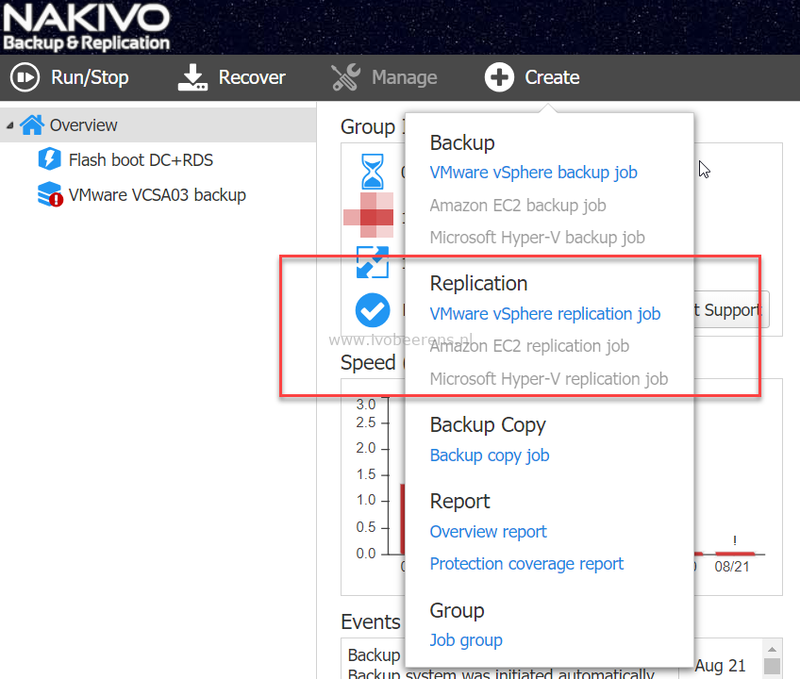 In this part of the NAKIVO Backup & Replication review I highlight the replication feature. 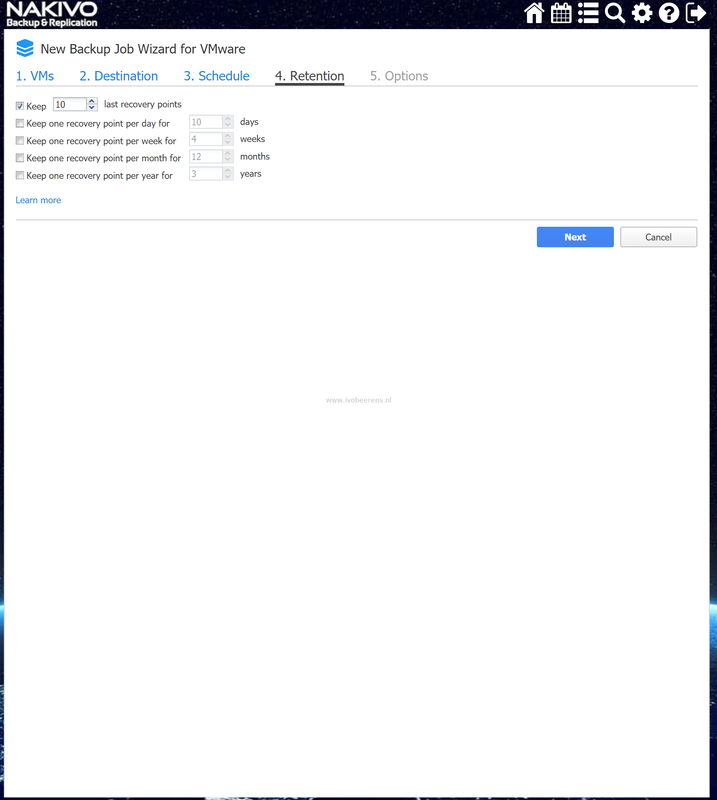 With the replication feature you can replicate VMs. 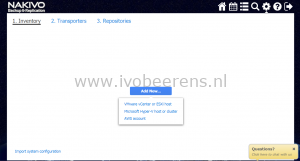 The source VMs are copied, a VM replica is created of each and replicated to the target VMware environment (also known as the recovery site). The replication feature can be used for business continuity as part of you’re disaster recovery plan. When a disaster occurs, the protected VM(s) can be quick failed over from the primary site to the recovery site. When the primary site is restored the VM(s) can be failed back to the primary site. 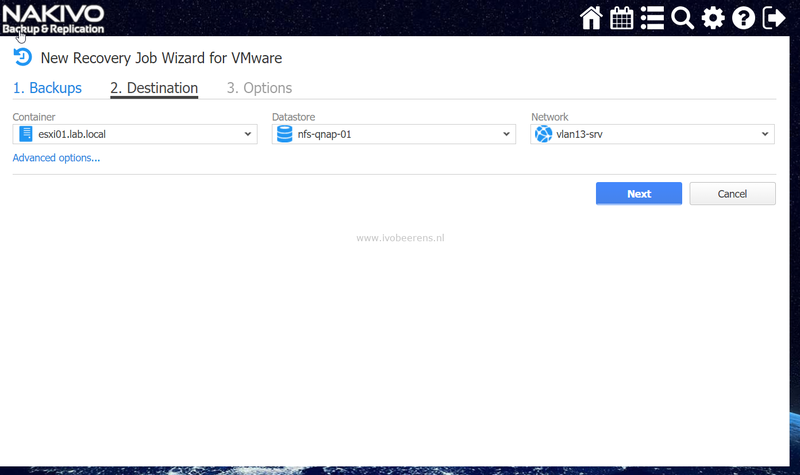 Another use case it to use replication for migrating the VMs to a new VMware environment for example when moving from on-premises to a cloud provider. 1. VMs. 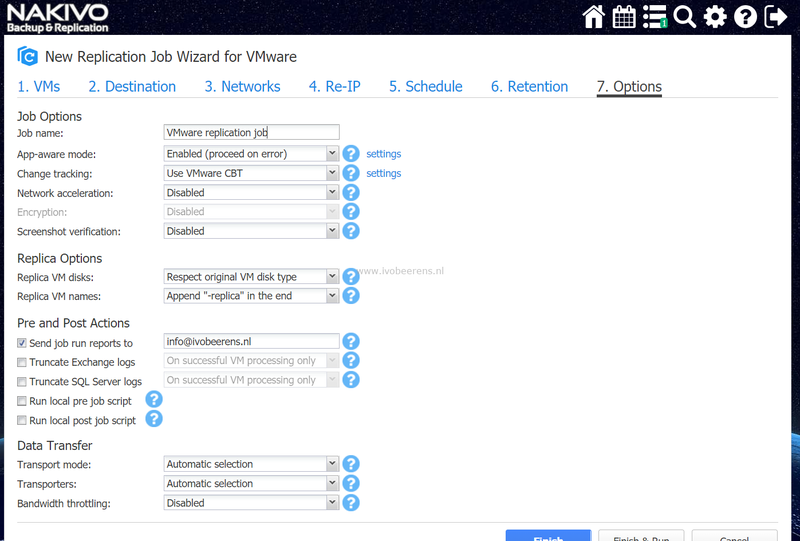 Select the VM(s) that will be replicated. 2. Destination. 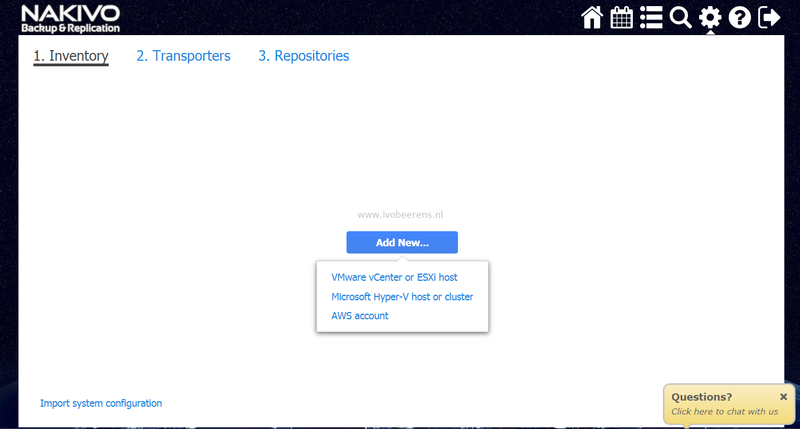 Select the destination host(s) and datastores the VM(s) will be replicated to. 3. Networks. 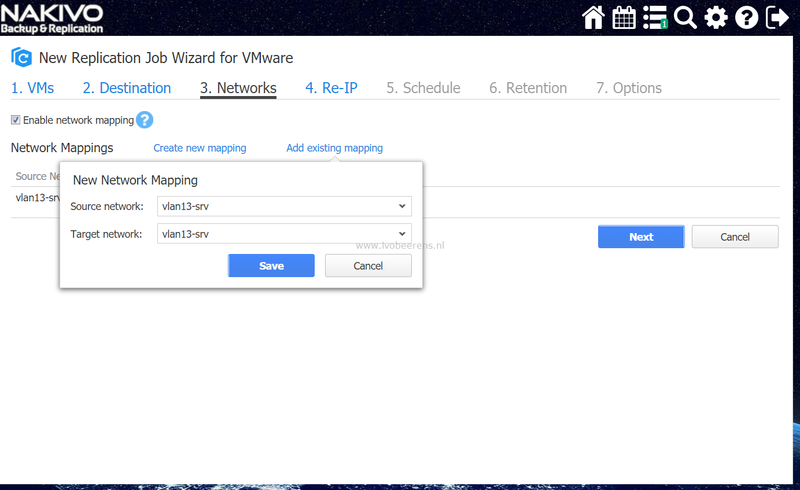 If the VM on the primary site has another network than on the recovery site you can make a mapping between them. In my test environment I have an stretched L2 network so the source and target network are the same. 4. Re-IP. 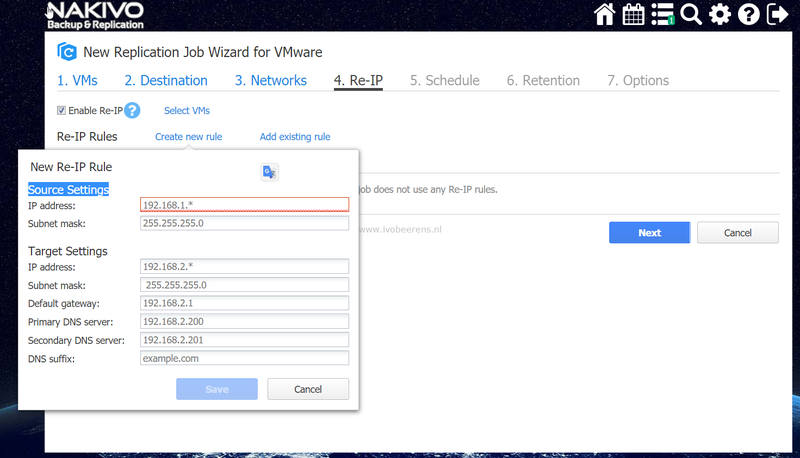 With this option the replicated VMs will be mapped to a new IP address. In my test environment I have an stretched L2 network so the IP address will not change. 5. 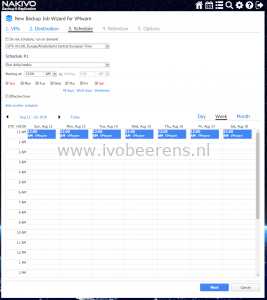 Schedule.Select the scheduling for the replication job. 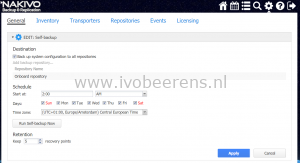 The VM replication will be executed at the schedules. 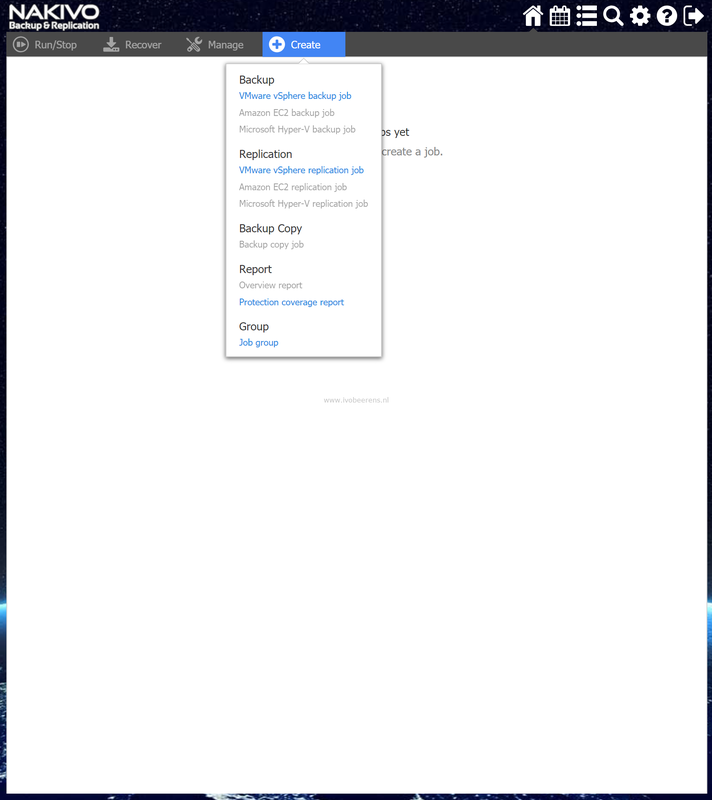 So note that the VM(s) in primary site are not synchronous replicated. 6. Retention. 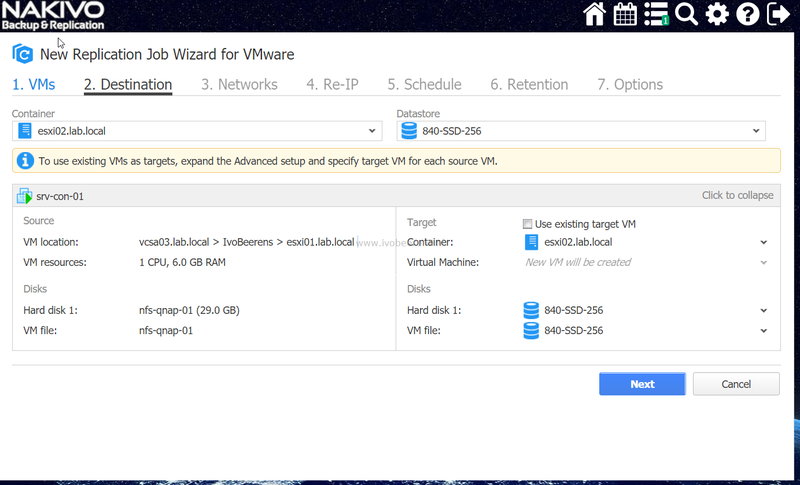 Set the retention for the replicated VMs. 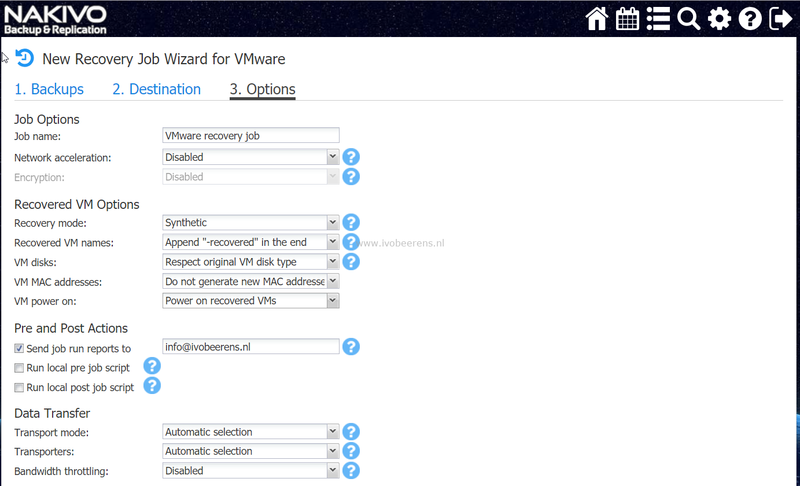 Per VM you can have up to 30 recovery points. 7. Options. Set the options for the job. Click on Finish & Run to start the first replication job. 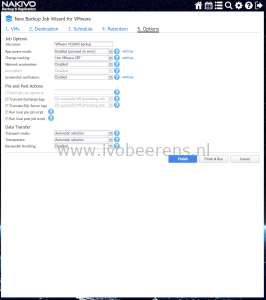 The VM will be replicated to the recovery site in a powered off state in the vSphere client. 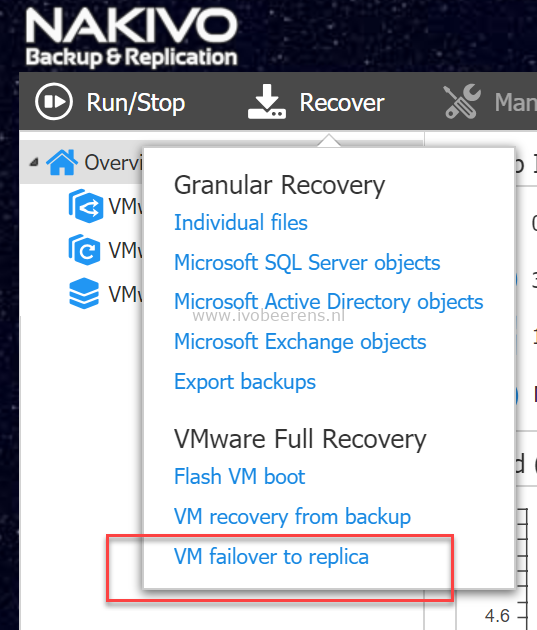 In the recover menu select VM failover to replica. 1. Source. 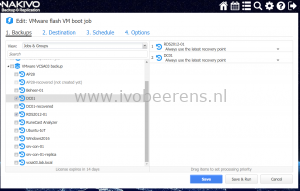 Select the VM and recovery point to use. 2. Networks. 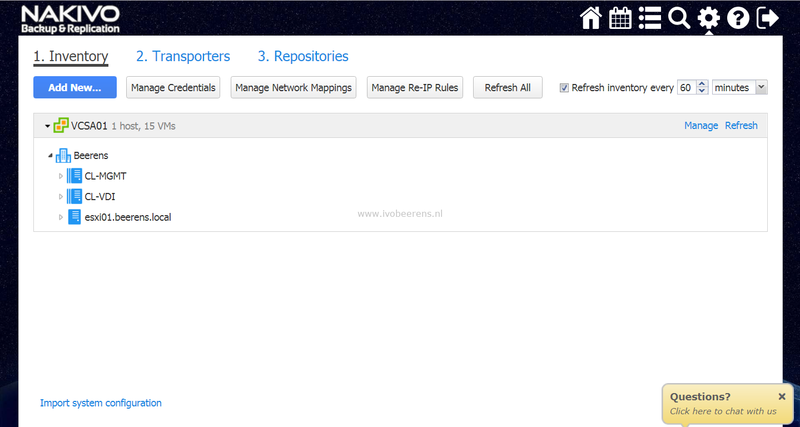 If the VM on the primary site has another network than on the recovery site you can make a mapping between them. In my test environment I have an stretched L2 network so the source and target network are the same. 3. Re-IP. 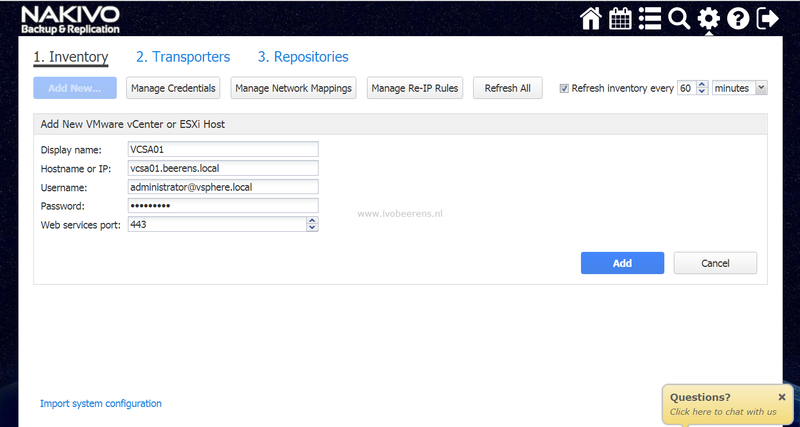 With this option the replicated VMs will be mapped to a new IP address. In my test environment I have an stretched L2 network so the IP address will not change. 4. Options. In the options section enter the job name. I checked the “Power off source VMs” box to prevent IP conflicts. Click on the “Finish & Run” button to start the recovery job. 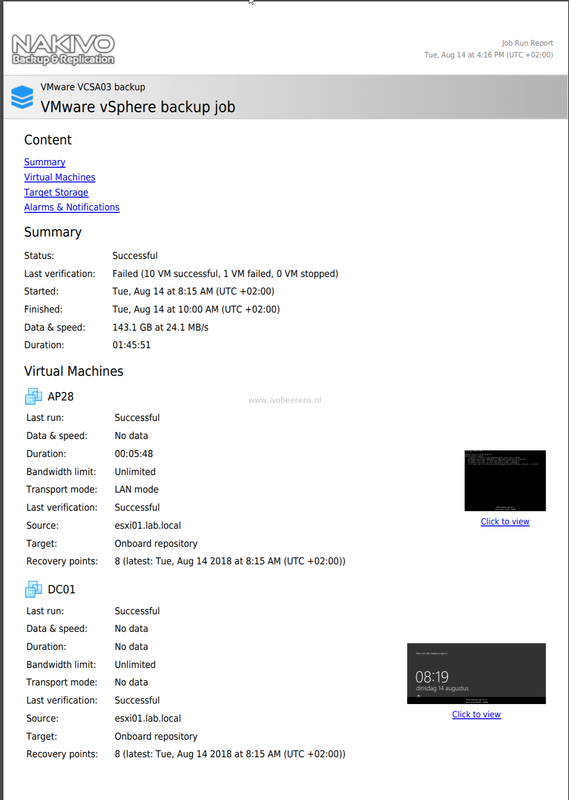 The VM in the primary site is powered off and the replica VM is powered on in the recovery site. In the vSphere client, the replica VM is running after the failover. After the disaster, the protected VMs are at the recovery site. When the infrastructure at the primary is restored you may want to return these VMs back. 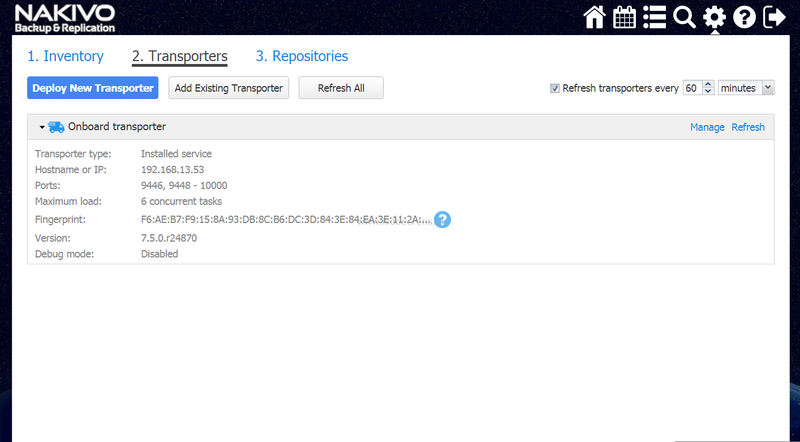 With the replication feature these VMs can be transferred back to the primary site. 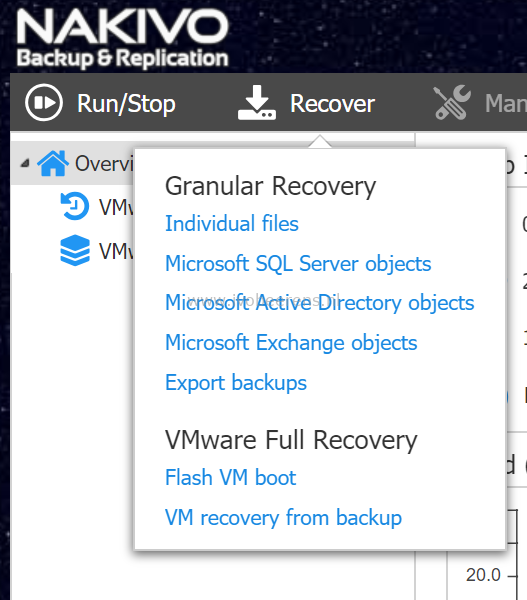 Transferring the VMs back involves performing some manual steps such as deleting the recovery job (with the keep recovered VMs option) and create a new replication job. 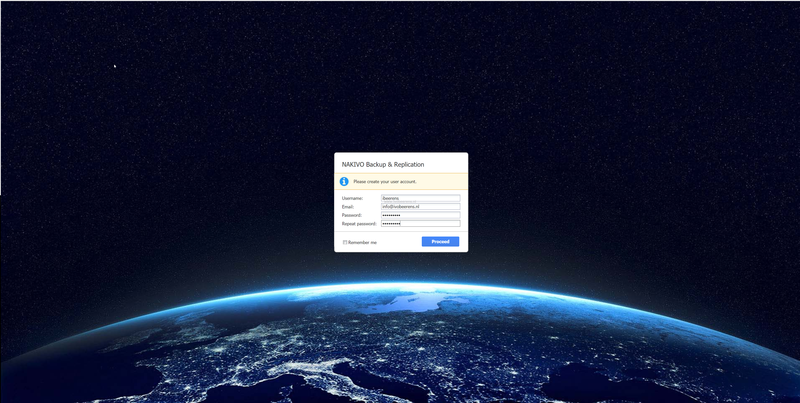 In a next release of NAKIVO Backup & Replication a new feature called “site recovery” will be introduced. 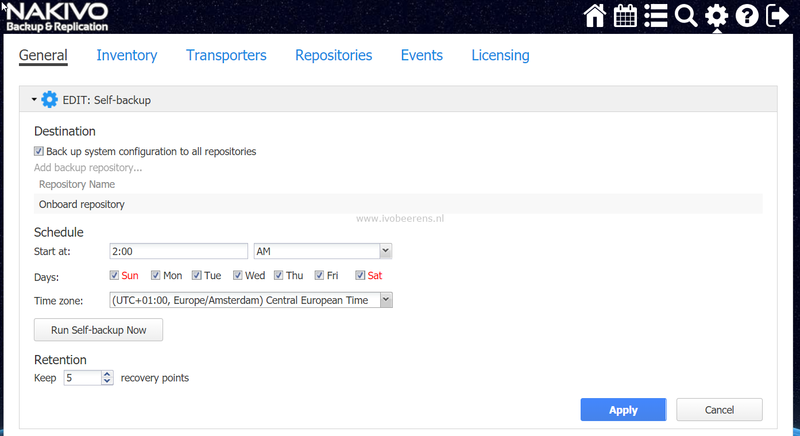 Site recovery will enhance the replication feature with for example automated testing and workflow options. With these options you can test for example if the disaster recovery plan works as expected in a isolated environment. More information about the Site Recovery feature can be found here link. In the next NAKIVO Backup & Replication review I will highlight the editions, licensing and conclusion of my four reviews. 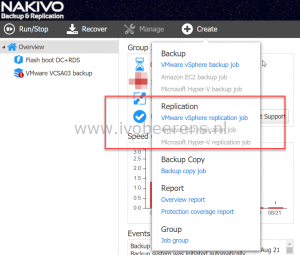 In this part of the NAKIVO Backup & Replication review the backup and recovery options will be highlighted. 1. 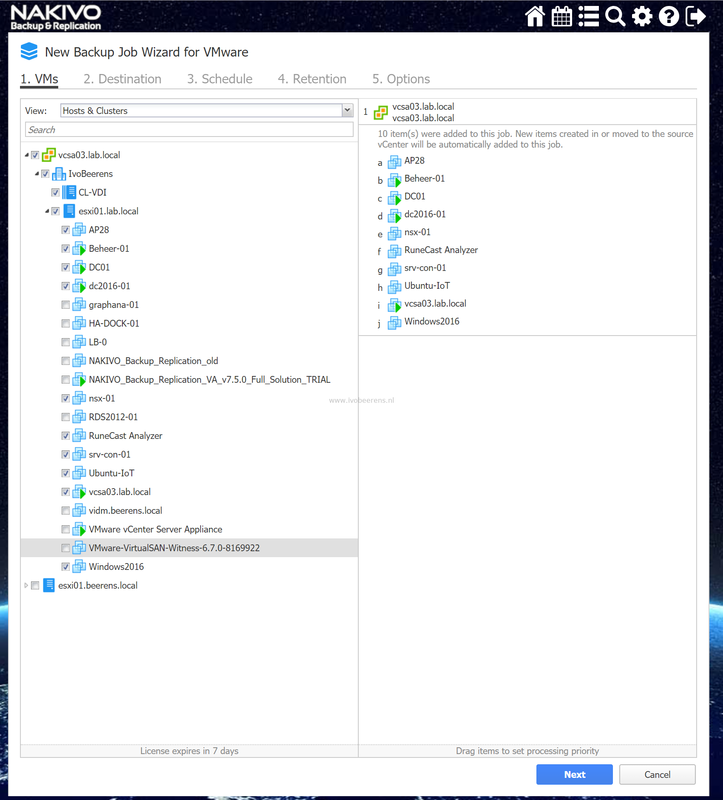 VMs: Select the VMs to backup from the inventory of the vCenter Server or ESXi host. 2. 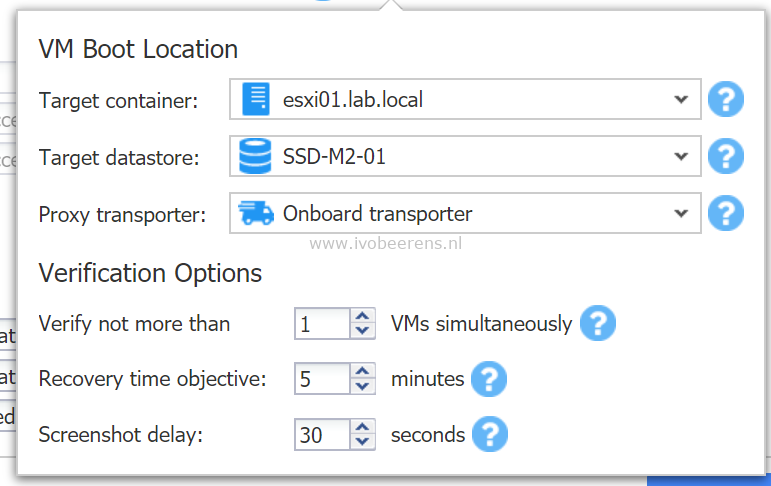 Destination: Select the destination to store the VMs. Select the onboard repository with deduplication and compression enabled for storage space savings. 4. 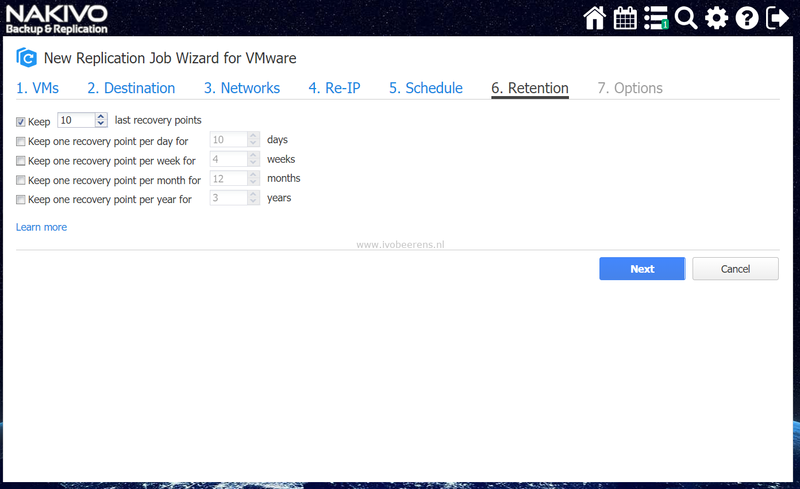 Retention: Define the retention period for each Virtual Machine (VM). Each VM will have one or more recovery points were individual files, application object or the the entire VM can be recovered. A Grandfather-Father-Son (GFS) backup rotation scheme can be used. 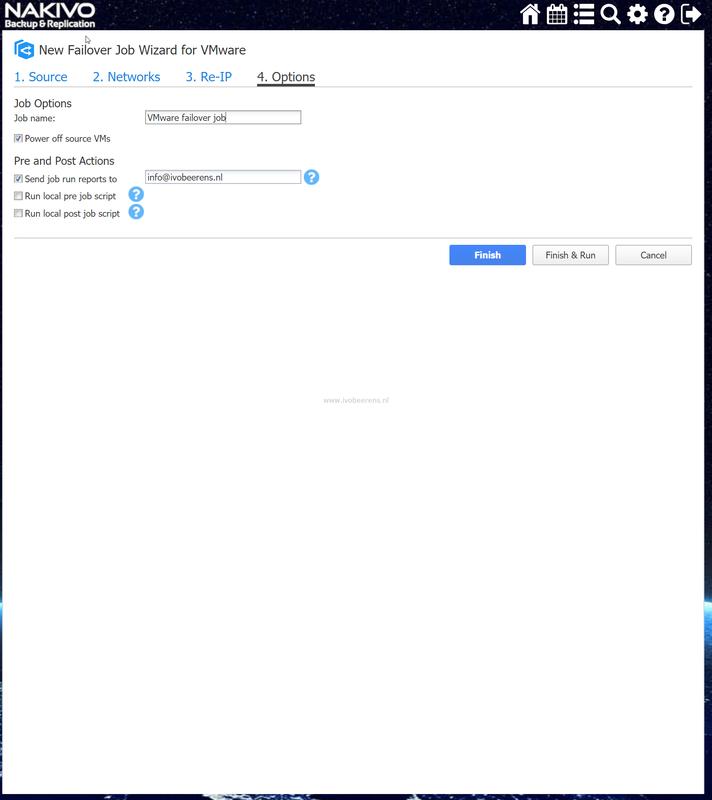 App-aware mode: Use this option for applications that require that the data is consistent such as Microsoft SQL and Exchange. Change tracking: Only the blocks that are changed since the last backup will be backup ed. This will increase the backup speed. 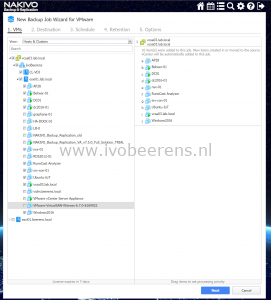 Screenshot verification: After the backup of each VM it will be recovered (with the network disconnected) and a screenshot will be made after the OS is started. The screenshot will be included in the email notification or in the job report. Email notifications: When the job completes the status is send by Email. 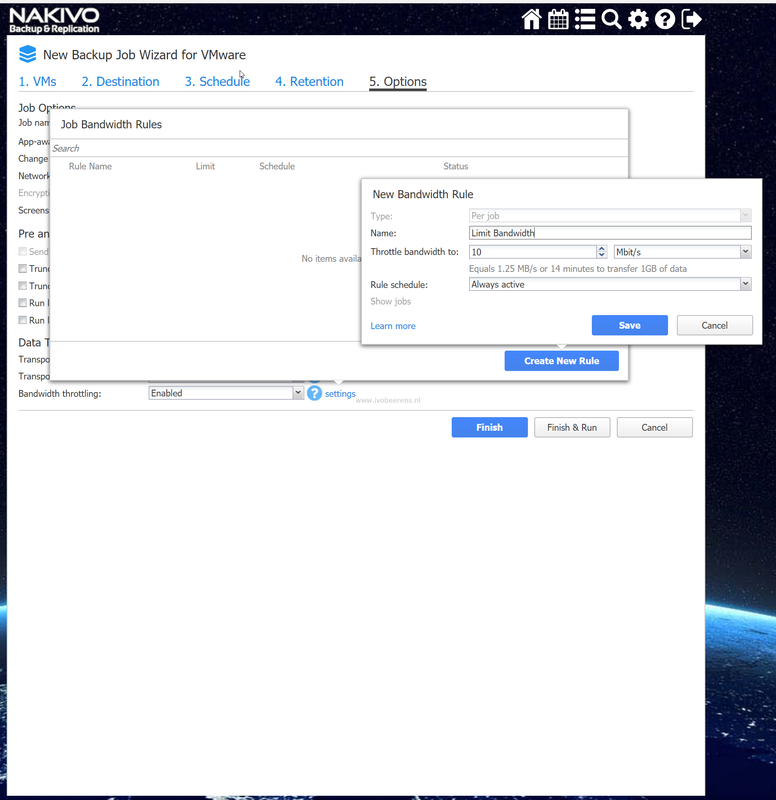 Bandwith throttling: With bandwidth throttling you can control the amount of bandwidth that is consumed by NAKIVO Backup and Replication. The are more options to configure, refer to the following link for all the options to configure. 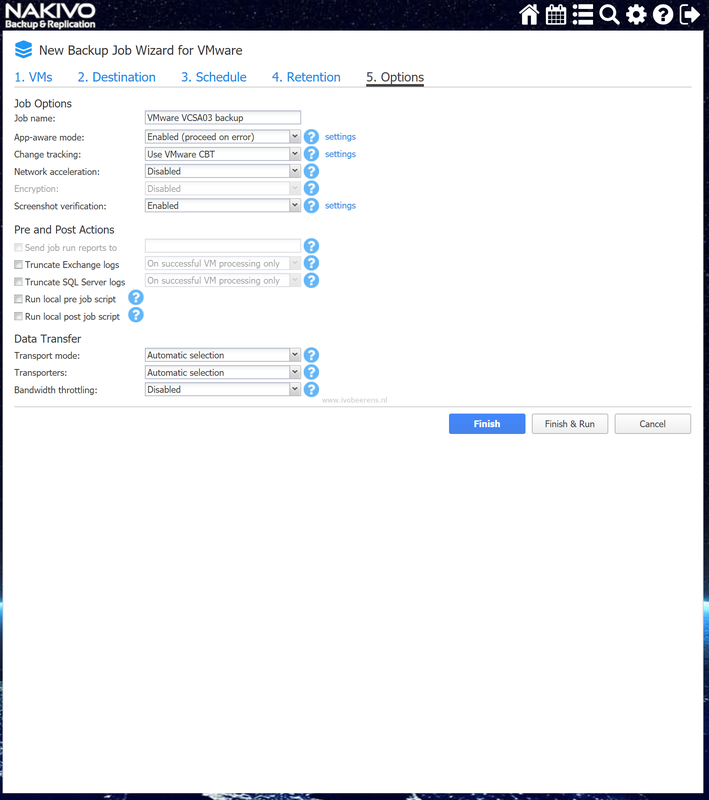 In 5 easy wizzard based steps a backup job is be configured. Last run report. Provides the status of the last run backup. Point-in-time report. Provides data on a particular job run. Job history report. 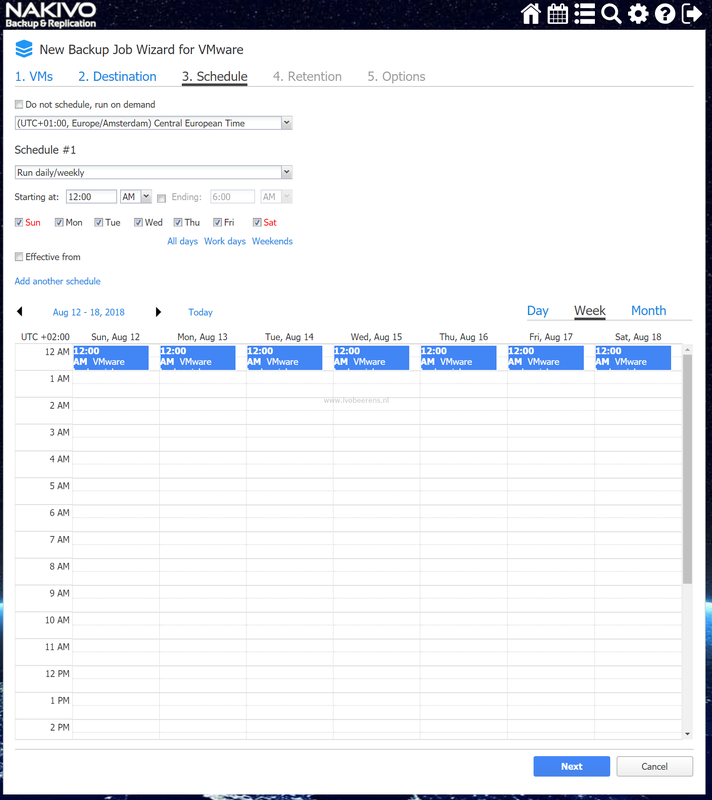 Provides data on job runs that occurred during a specified time period. Protection coverage report. 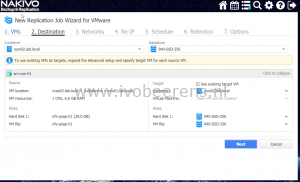 Contains information about all VMs and instances protected by backup and/or replication jobs, as well as about all unprotected VMs and instances. 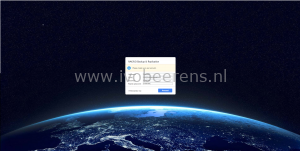 This report can be created manually or in the backup job you can specify the email address of one or more recipient(s) were the report will be send to. When screenshot verification is used, the screenshot is also included in the report. 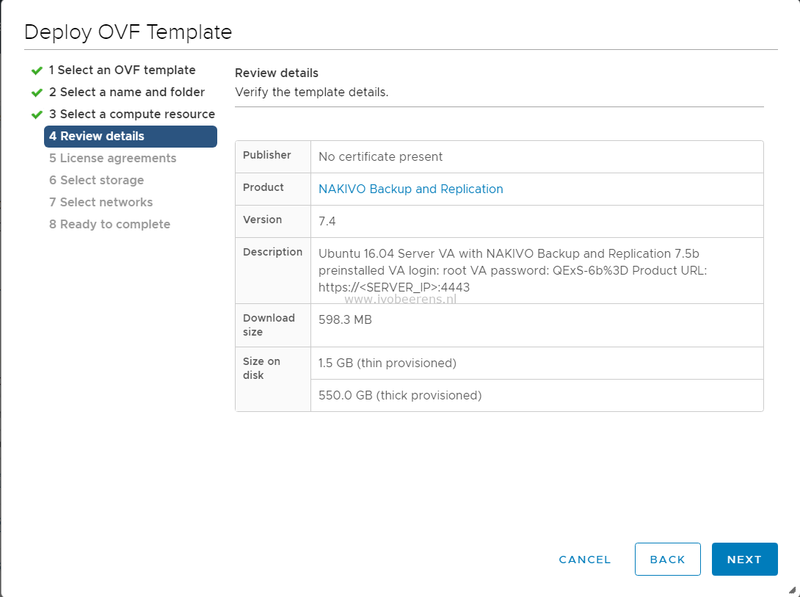 The configuration of the NAKIVO Backup & Replication server /appliance can be secured by using the Self-backup feature. 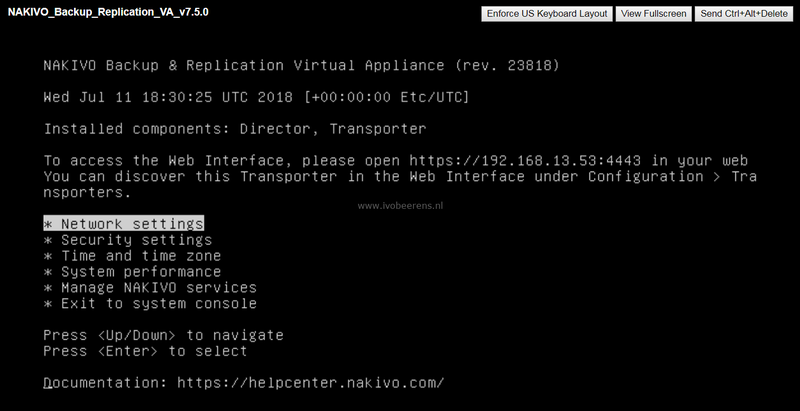 When something happen with the NAKIVO Backup & Replication server the configuration can be quickly restored on another server. Individual files. 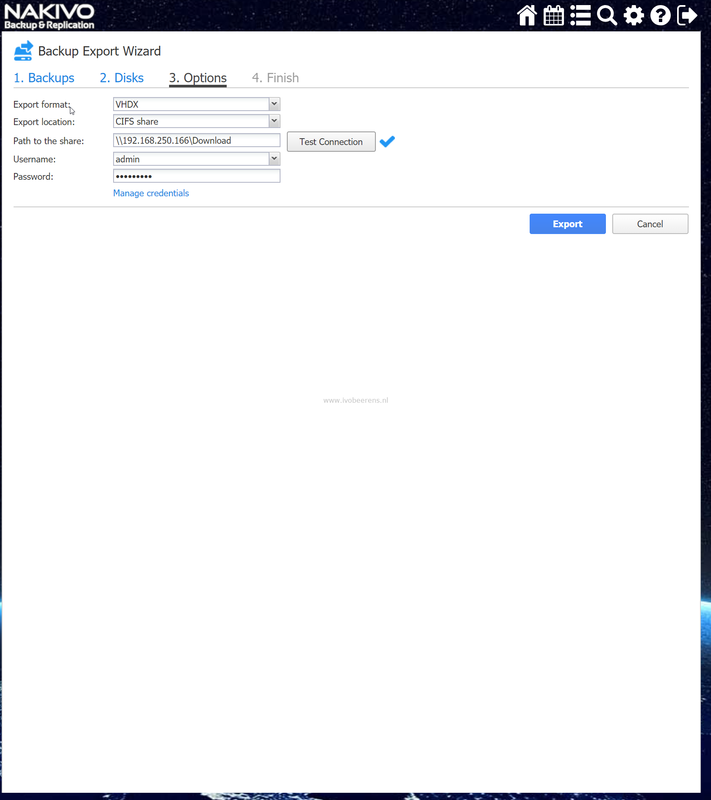 You can recover files or folders directly from compressed and deduplicated repository. Microsoft SQL Server objects. 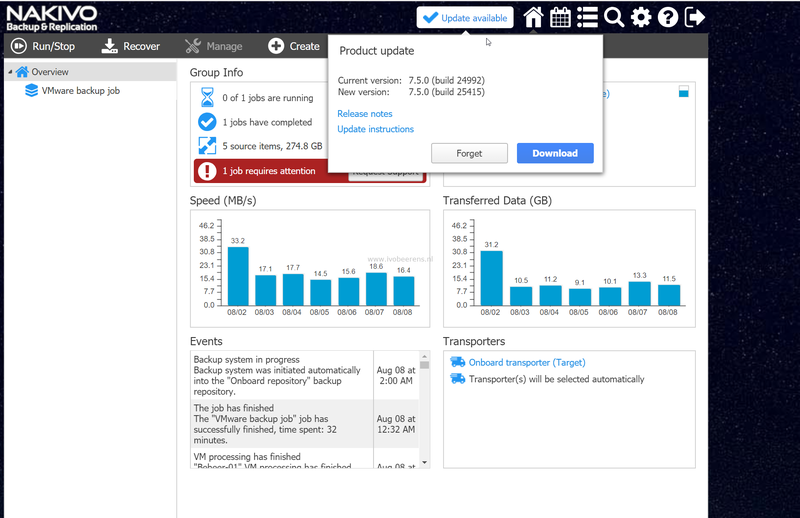 Enables browsing, searching, and recovering Microsoft SQL Server objects. Microsoft Active Directory objects. 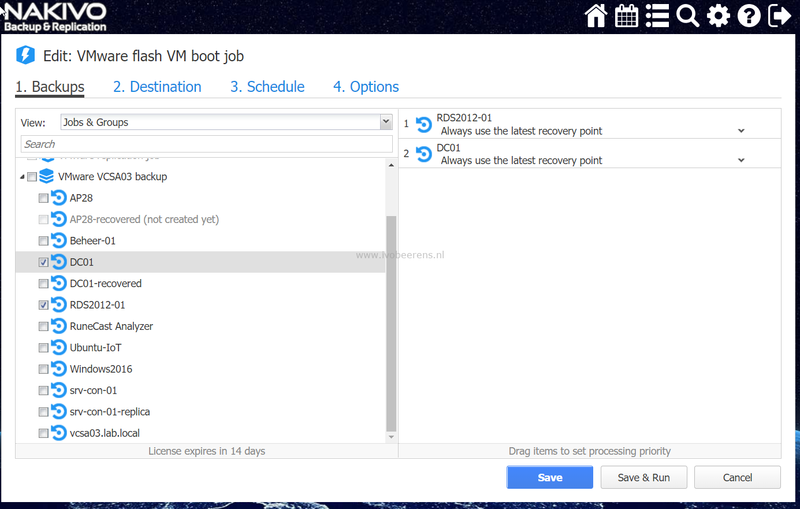 Enables browsing, searching, and recovering Microsoft Active Directory objects. Microsoft Exchange objects. 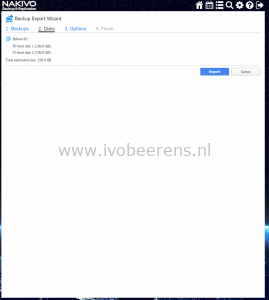 Enables browsing, searching, and recovering Microsoft Exchange emails. Export Backups. This is called “Cross-Platform Recovery” and will be handled in the next paragraph. 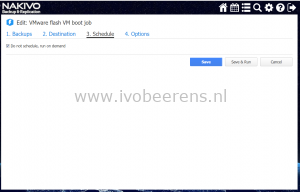 Flash VM boot. 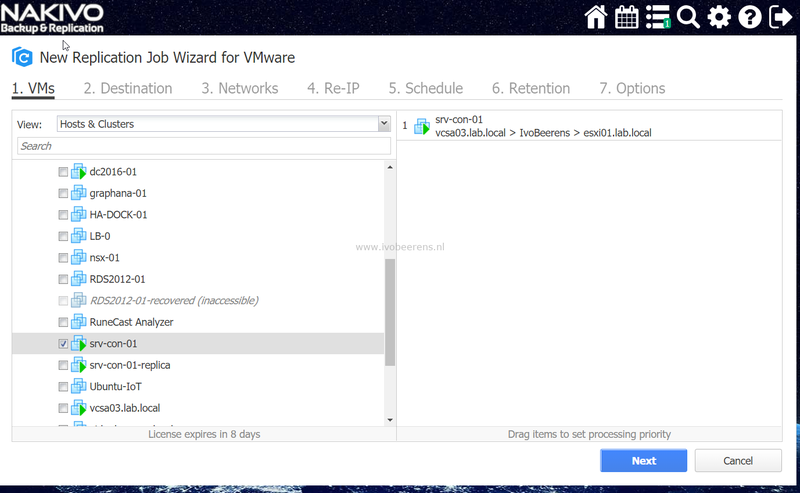 Enables to run VMware and Hyper-V VMs directly from repository without the need to recover the VMs first. 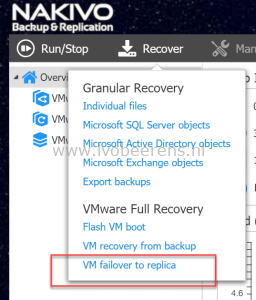 VM recovery from backup. Full VM recovery. When you recover a VM, a new VM is created and the “old” VM is retained. Individual files. Individual files per VM can be restored. The files can be recovered on a server (for example on the same location as deleted), downloaded to the browser or emailed. 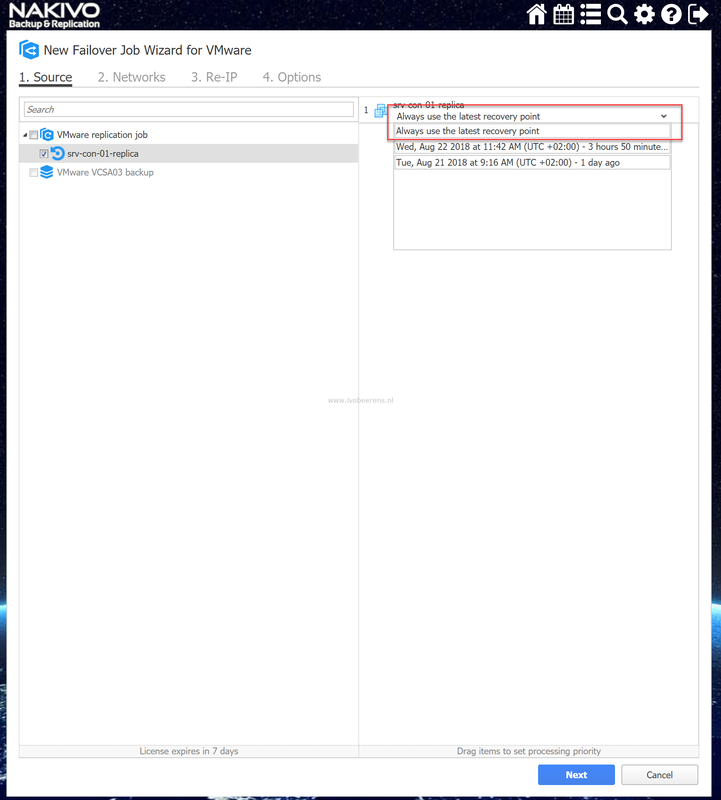 I tested to recover two PowerShell files from a VM and selected the download to browser option. The files recovery is performed in seconds. 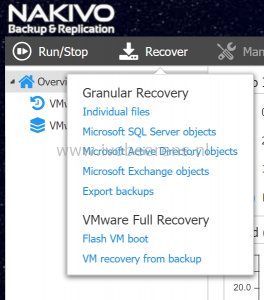 VM recovery from backup. 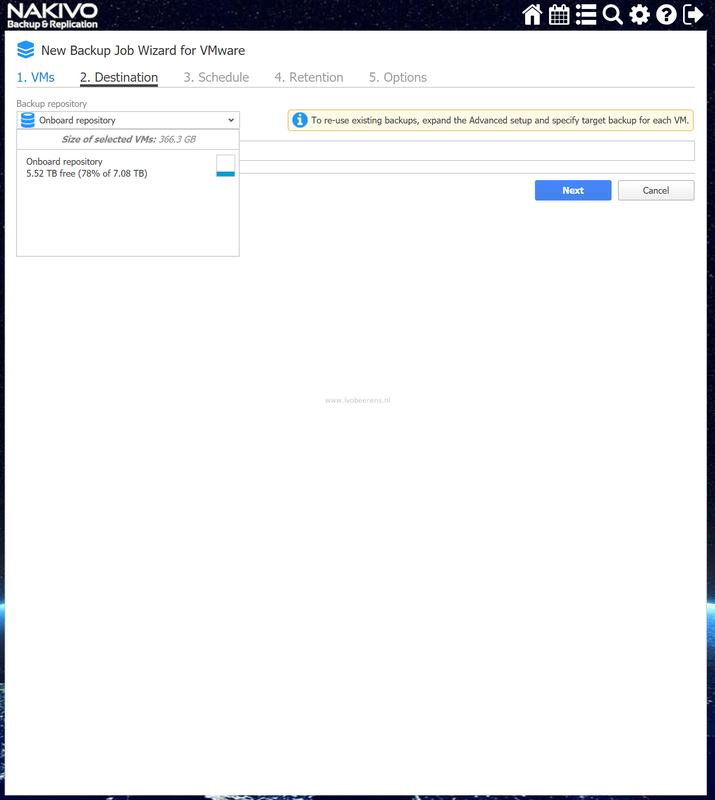 With this option one or more full VMs are recovered. 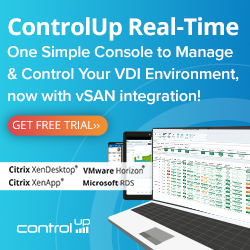 The original VM will be retained so the recovering VM will not overwrite the original VM. 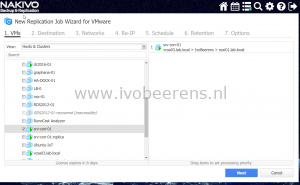 The recovering VM name will append “-recovered” in the end. The recovery is fast. 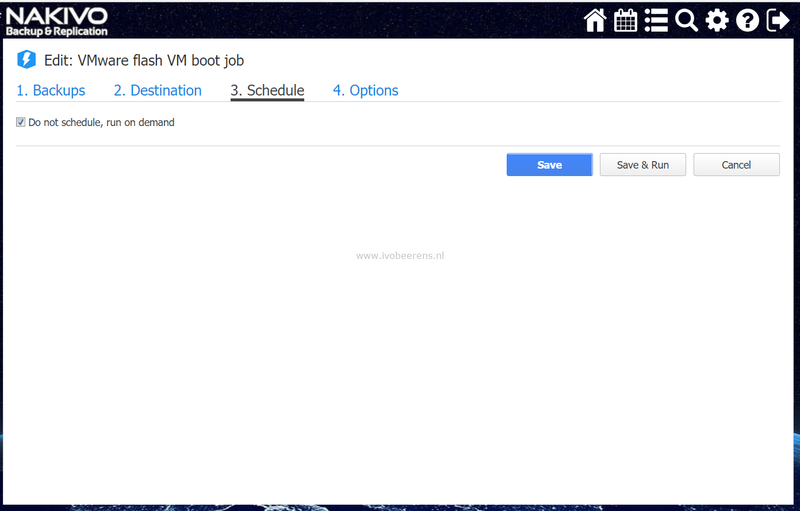 VM Flash boot. 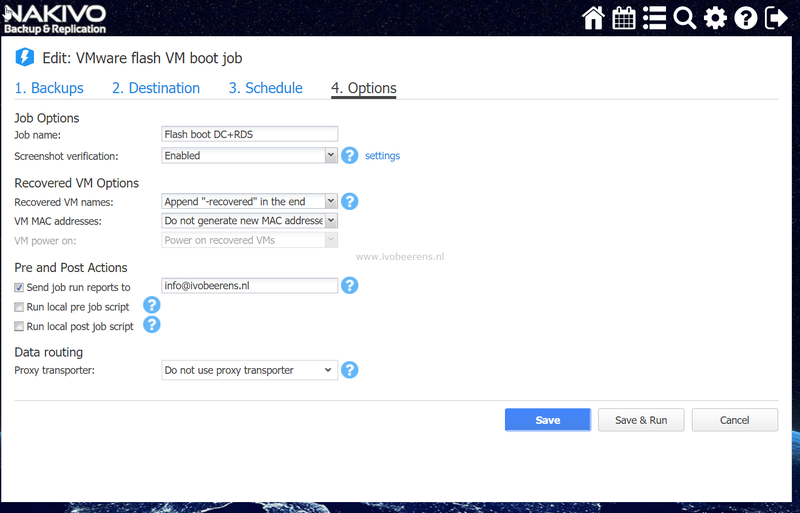 With the VM Flash boot option it’s possible to boot VMs directly from the compressed and deduplicated repository without recovering the VMs first. This saves time and can be used for example for testing software updates. 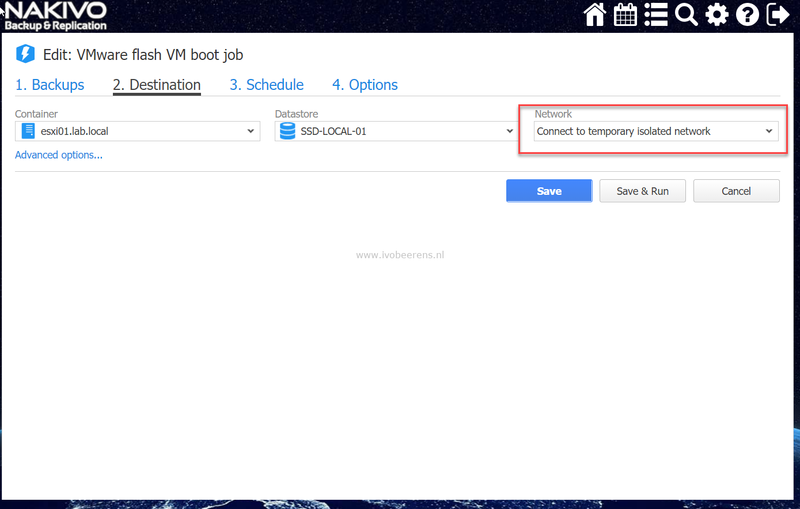 VM Flash boot uses iSCSI technology to connect VM disks stored in the backup to a target to the ESXi host. 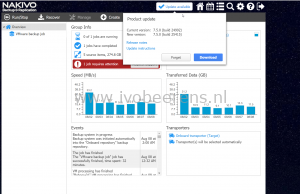 In this test I recovered two VMs in isolated network and performed a software update for testing. The changes are not written to the recovery point that i’m using. When i’m finished with testing i can discard the VMs with a single click so that all the changes are lost. 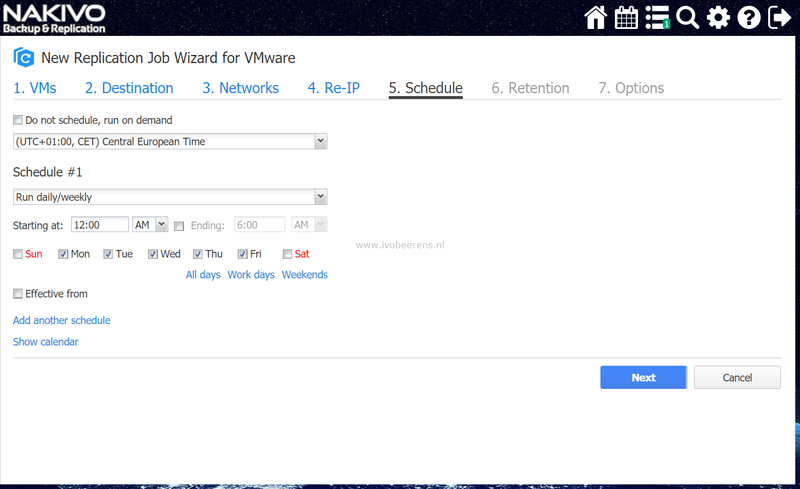 This allows you to recover VMs in different environments (VMware to Hyper-V and Hyper-V to VMware). 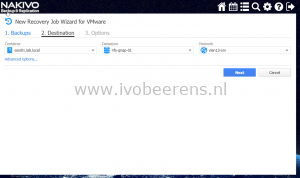 In this testI exported a VMware Virtual Machine with two VMDK disks to VHDX disks with the Backup Export Wizard. 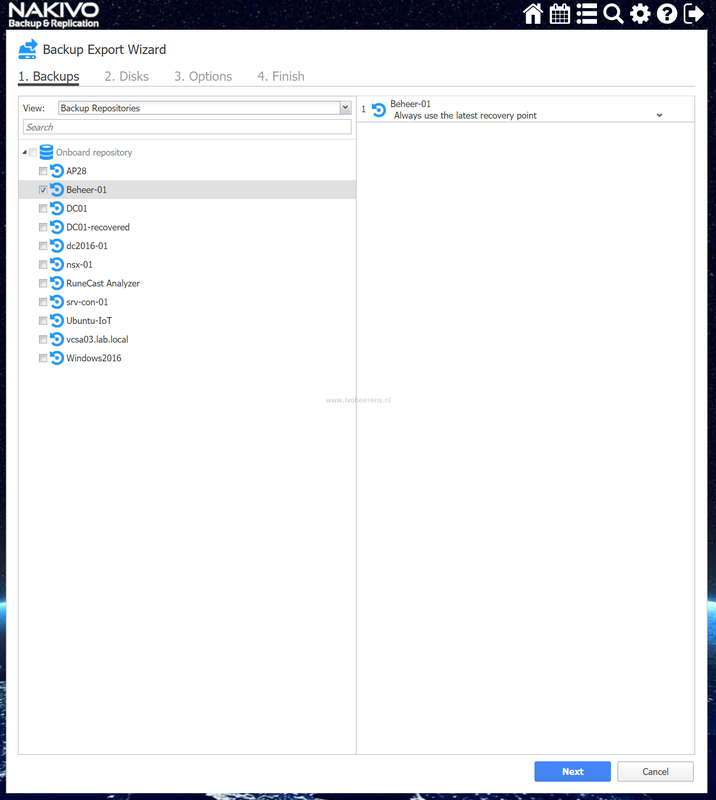 The “Export backups” wizzard is used and by selecting the VM and recovery point, disks and options to start the export job. 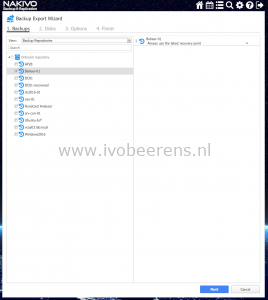 When the export completed, I created a new VM in Hyper-V Manager and pointed to the restored VDHX disks. 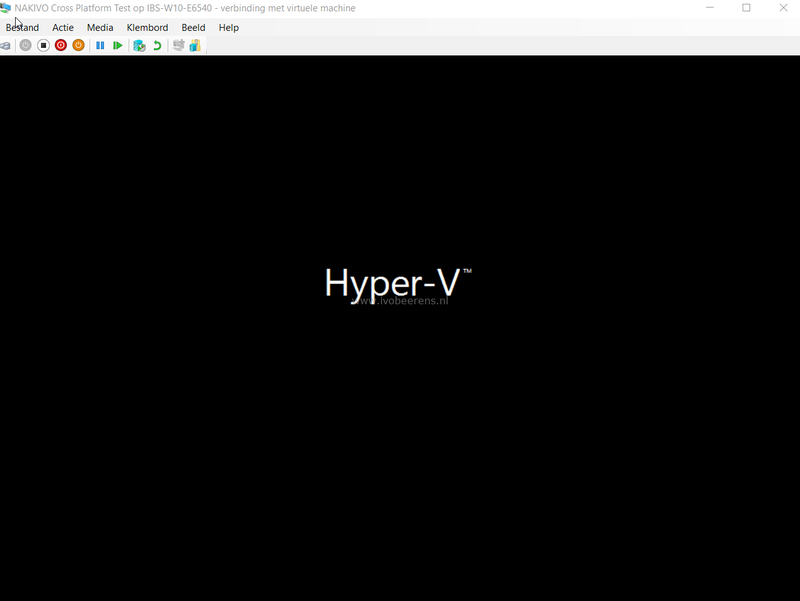 Then i was able to start a Hyper-V VM with the exported disks attached. 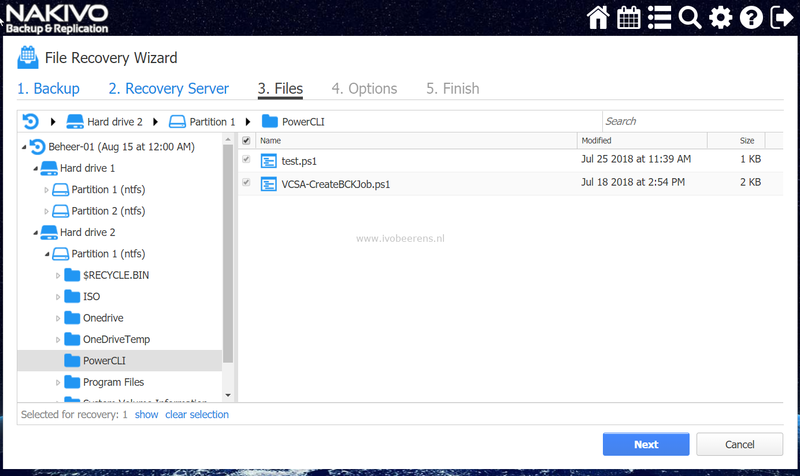 Cross-Platform Recovery can be used for recover VM disks from between hypervisor such as VMware vSphere to Hyper-V and to VMware Workstation and VirtualBox. 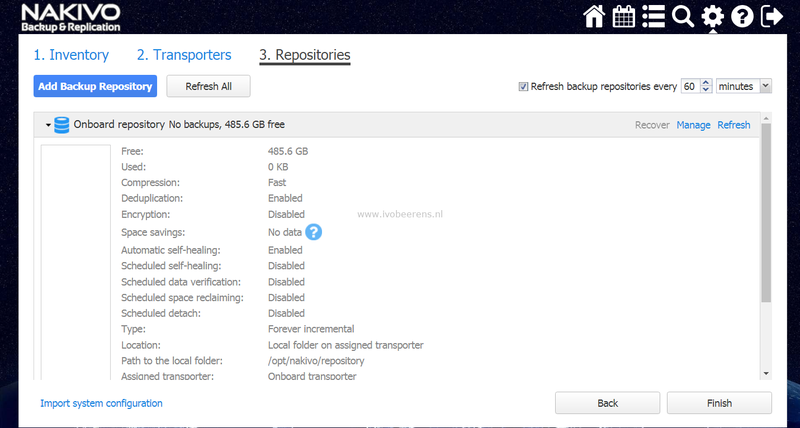 In this part of the NAKIVO Backup & Replication review I highlighted the backup and recovery features. It was a pleasure to test the backup and recovery features because they were easy, quick and they worked out of the box without any troubleshooting skills needed. In the next review I will highlight the replication feature.